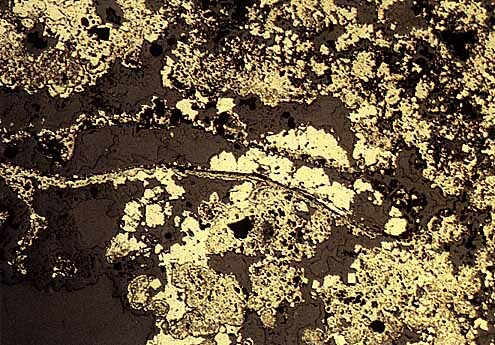 Radiating, botryoidal, poorly crystalline pyrite (brown, lower reflectance, bottom centre) is overgrown by euhedral to subhedral pyrite (yellow-white, higher reflectance, centre bottom) and minor marcasite (white, centre bottom left). The east-west linear feature is an organic structure-a worm tube? that is partially infilled by pyrite (centre). Dark grey areas are matrix and resin (bottom left).